Trimming the cat’s claws is a prospect that probably fills most owners with dread. They’re squirmish and stubborn creatures at the best of times and many cats really hate being handled. This makes restraining them for long enough to have their claws clipped a bit of a challenge. 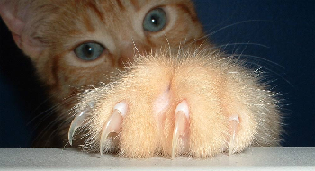 While most cats can maintain their claws themselves, for some indoor and elderly animals, nail trimming is important and should form part of their regular care routine. 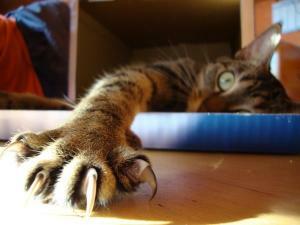 If the claws become too long they can curl underneath the paw pads and cause discomfort. They are also more likely to break or split if they are left to grow untended. It could be that the length of your cat's claws is behind an existing scratching problem at home that can’t be resolved until the nails are cut. Cats scratch out of instinct and, rather than trying to curb the behaviour altogether, it is better finding ways to facilitate it. Scratching is actually very important for a cat’s well-being, so, in the right places, it should be promoted and praised. Scratching posts are essential for households with cats, especially those that are kept exclusively indoors. When it comes to trimming the nails, the earlier the process is introduced to your pet, the better. Start by gently massaging the paw whenever you get chance, allowing the cat to flex its claws and retract them, before placing the paw in your palm. After doing this a few times, your cat should show no aversion to having you apply a little pressure to each of the claws, pressing and massaging it gently between your finger and thumb. Repeat this process daily until your cat feels confident with you holding its paws. Many aspects of grooming i.e. brushing teeth, bathing and nail trimming can all be frightening initially, but if they become an established practice early on, they are less likely to cause anxiety and fear. The sooner you can get your kitten used to having its paws held, the better for everyone. Being able to maintain a firm grip on the paw without your cat flinching or shying away, is critical for successful nail trimming. A cat that isn't comfortable with this won't be a calm candidate for the procedure. It is also important to ensure both you and your cat are relaxed before getting out the clippers, as nail trimming requires concentration and patience to do it correctly. Be mindful of attempting to trim your cat's claws after a period of play or in the presence of other household pets that could prove a distraction. To avoid an accident, keep your cat well away from the window so that the company of birds and wildlife doesn't rouse it from its relaxed state. The best time to attempt the job is when your cat is calm and sleepy or has curled up in your lap for affection. If, on the other hand, your cat is fidgety or upset, you are much more likely to accidently cut the quick and injure your pet. The nail tip is transparent - the part you want to trim - whereas the quick is light pink and towards the base of the nail. The quick is blood-filled and will cause pain and bleeding if cut. If you aren't sure where to cut and where to avoid, ask your vet to show you. Trimming a cat's claws is by no means easy, so don't feel guilty if you can't manage it! Your vet will be able to demonstrate the safest and most reliable method, or, if you're really reluctant, will be able to trim the nails for you. - Hold your cat in your lap and focus your attentions on stroking its favourite areas i.e. under the chin, the scruff of the neck and the base of the tail. It is better to wait for your cat to come to you rather than chasing it around the house or trying to force it into your lap. After a moments' stroking, move onto your cat's paws, massaging them gently and running your fingers along the claws. - If you sense your cat is comfortable with this, press lightly on the top of each toe to extend the claw. If your cat fidgets at this point, wait a moment before trying again. Once the claw is extended, examine it to find the quick. You want to be sure precisely where this is before taking your clippers to it and accidentally causing your cat serious harm. - If your cat has tolerated things so far, don't take advantage of the situation by rushing to clip the nail. Remember, it is only the tip of the claw you want to lose and any sudden movements could jeopardise the calm you have created and mean you take off more than necessary. You could also accidently nick the nail quick and cause bleeding. Your cat is unlikely to sit still to allow you to treat this and may run away and hide. It could be a long while before your cat approaches you for a cuddle again. - Taking your time could mean that, when it comes to clipping the nail, your cat hardly even notices it. To reinforce its good behaviour, give your cat a treat for every successful nail you trim. With her sat still and behaving, it can be easy to get carried away and keep on trimming until she tires of you playing with her paws. But you don't really want this to happen; it is better that you stop before your cat gets bored and restless and go back to it another time, than you persevere only for your cat to move suddenly or become stressed. This is when accidents happen. Please could you recommend the best clippers for cutting claws? Also do you sell them? Yes, we sell a wide range of nail clippers on our website, suitable for dogs, cats and small animals. Most of these are easy to use, guillotine-style clippers with non-slip handles. All are ergonomically designed to make the nail trimming process as easy and stress-free as possible and it might be a case of trial and error to find the best ones out there. Simply search 'nail clippers' on our website and it will direct you to the right page. Depending on the size of your pet, we sell both small and large size clippers. It is important to choose the right size to get the job done effectively and without causing injury to your pet.